Essential Care (now know as Odylique) is a Suffolk based company with a wide range of hair and body products as well as make up. All products are natural, organic, not tested on animals and free from synthetic ingredients. I accepted an offer to try their new concealer. Majority of the time I am looking to cover dark circles as luckily spots are only a once a month problem for me. 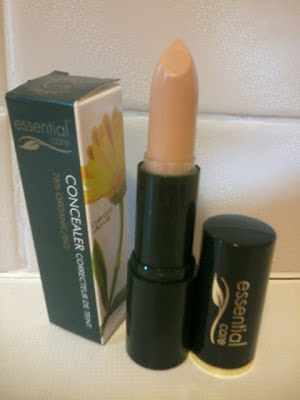 This concealer is soft and blends easily. It appears to last a working day with a little bit of movement especially in fine lines however this is easily blended out using a finger. I decided the best way to demonstrate the product is with some before and after pictures. I have been very happy with the results. My dark pigmentation is covered in a way that is very natural. I am not a fan of illuminating concealer that often give you a shimmery shadow. For my USA readers the results and consistency are identical to the Priia concealer. I have been using the colour fair but it is also available in medium. Thanks Sarah. It's really difficult I guess to hide blemishes altogether without seeing the concealer on the skin either. It's either disguise the blemish a little and not see the concealer or hide it completely and see the concealer. Lovely review! The coverage looks really natural but does a great job at covering darkness... Not sure if it's worth the price tag, though. This looks nice! I like my RMS Beauty un-cover up, but it's too light for me at the moment. It creases a little bit, but it's a natural product. Have you tried anything from RMS Beauty? I'm also trying the rms uncover up I got a sample from being content! I really like it and covers under eye and spots and can be used as extra foundation if It wears thin throughout the day. I'm looking forward to trying other brand so seeing other people try them is great! Love the review as well looking to try other brands so it's good to see what other people think of them.